The impression you make is the difference between success and failure. Our full color presentation folders will definitely impress your new and existing clientele. 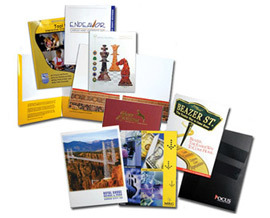 Presentation folders come in a variety of sizes using standard or custom pockets and die cutting. In addition to printing your folders, we also offer UV &amp; Aqueous coating as well as full coverage Lamination to give your presentation folders a unique high impact finish. 1. Select options for your presentation folders. 2. Add presentation folders to your list.